145 (Early Series; PPP and Remued) Cylinder vases. Does this shape appear in other series? Yes, Pamela 7 (and probably Early Series 171 too) are like 145/4. Pamela 10 is like 145/6M. 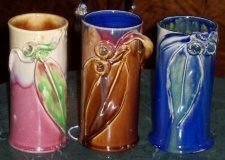 There were various other cylinder vases too; for more details click here. There is also a jug version; Early Series 172. No.145 came in a wider range of sizes than any other Remued shape. 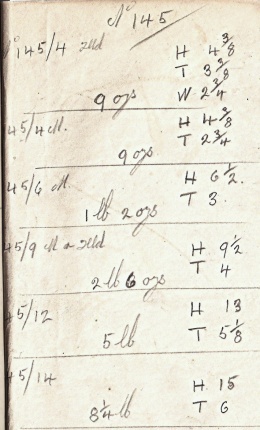 The image database records 3, 4, 6, 8, 9, 12 and 14 inch varieties. Size was denoted by inch suffixes (no 'L' or 'S'). Most sizes are found both with and without applied decoration. Applied decoration was denoted by an 'M' suffix (although there are decorated examples with the suffix missing). 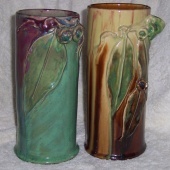 Decorated 3 and 6 inch examples are recorded dated 1934. Only the 8 inch size is recorded stamped PPP. It's not known what was "same as 145/4"
(maybe Pamela 7, or Early Series 171) but whatever it was, it bequeathed us these shape-book details. Height; 34 - 37 cm No 'M' version yet recorded. These are amongst the tallest pieces of Remued we have ever seen. There are also numerous un-numbered examples. This particular shape book is believed to date from the middle or end of the Later Series period. The 145/8 size was apparently made only at the beginning and had already been dropped. Height; 20 - 21 cm. Diameter; 11 - 12 cm. This is a very early variant. It must have soon ceased production and is consequently rare today. It includes the only 145 cylinder yet recorded with a PPP stamp. 145/8 is missing from the shape-book entry below which dates from the middle or end of the Early Series period. The width-to-height proportion is wider than other sizes. Base inscriptions like this - with a shape-number and a date - are extremely rare, and of great value in piecing together the history of the Remued range. If you have any Remued piece with such an inscription we'd be delighted to hear from you! Contact us. Undecorated 3 & 4 inch cylinders differed from larger sizes in that they had a flare to the lip. Decorated examples, however, had no flare.